After a rather disappointing weekend on the meat front, I had arranged to ‘meat’ a friend for dinner on a recent Thursday and when he asked what my preference was, I exclimed ‘Meat…I want lots of meat!!!’. – Yes I’m a full on meat eater and proud! Thursday came and I was told to meet him at Tottenham Court Road. Upon meeting him there I was advised that the table had been booked for 8pm and seen as it was now 8.30, he would need to call up and find out if they could still accommodate us. Lucky for my rumbling tummy, they were more than happy for us to claim our table. Whilst walking to the restaurant I was advised that I should never google the following three words ‘Gaylord’, ‘Meat’, ‘Good’ – apparently the listings are slightly obscene. Gaylord is by no means new to me, whilst I have only eaten at the London branch once before, I have eaten at the Mumbai restaurant many times. A regular hangout of my father’s back in the 7o’s, he has on many occasions taken us for late lunches to Gaylord and the food has generally been good. We entered the restaurant and were seated pretty efficiently. We had to wait a few minutes for our menu, but were given adequate time to decide on our food before the waiter came to take our order. We started of with the Vodka Golgappa shots. 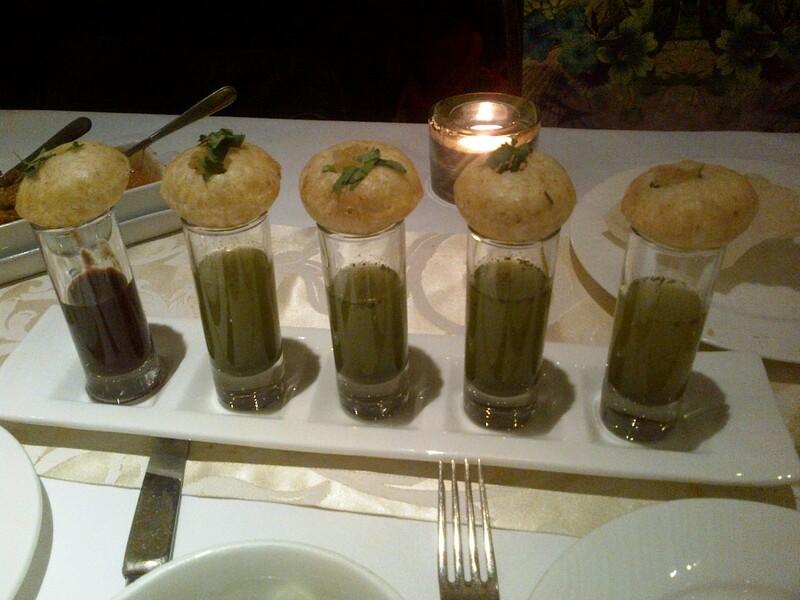 A traditional Mumbai street food, Golgappa or Pani puri is the perfect mix of flavours and I must admit, the vodka golgappa’s made for the perfect starter with a little kick. In line with my initial request of a pure meatfest, we ordered a mixed grill on the Sigri – live charcoal, the Galouti Kebab and some garlic naan. 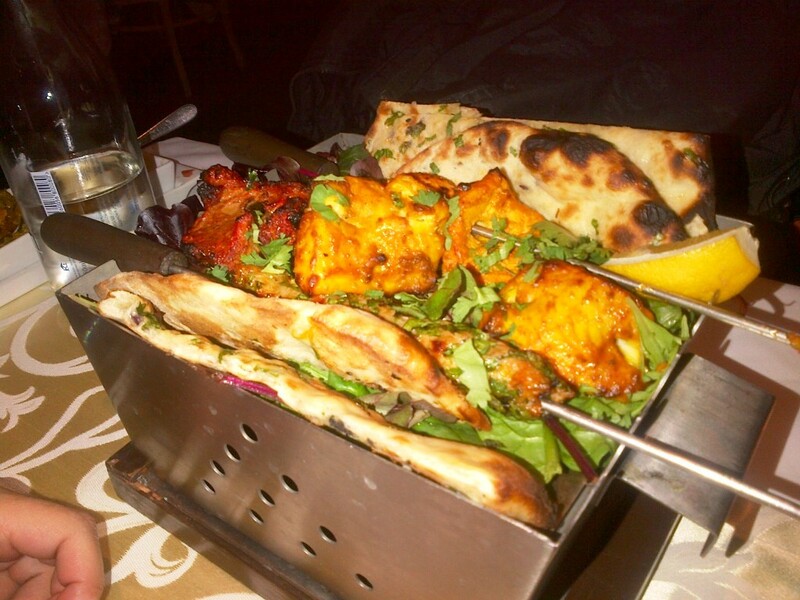 The chicken tikka was cooked to perfection, it was soft with a mild flavour, not overpowering or overly spiced. I’ve been to various Indian restaurants in the past that over spice the meat so that all you can taste is the spice and your mouth burns after. This chicken tikka gets a thumbs up from me. The tandoori tilapia was soft, again not at all overcooked and the flavours were good, I have to say I still prefer the tandoori fish at Lahore simply because they manage to get the outer edges slightly crispy whilst the fish is soft and flavoursome. Whilst I insisted that I didn’t want any of the lamb chop, I was told that if I was planning to blog about the place, I’d better try everything!!! The meat was super tender and flavours were good, but my dining partner, an avid lamb chop eater claimed that the lamb chops at Lahore are slightly nicer. The Murg gilafi seekh I have to say was very very nice, it was extremely soft and flavoursome, I have nothing more to say other than that I was very very impressed! The last part of the order arrived shortly after the Sigri. For some reason the second I read the word Glouti, I knew I had to order it, not sure if I’d tried it the last time I visited but regardless I was very very happy that I did. 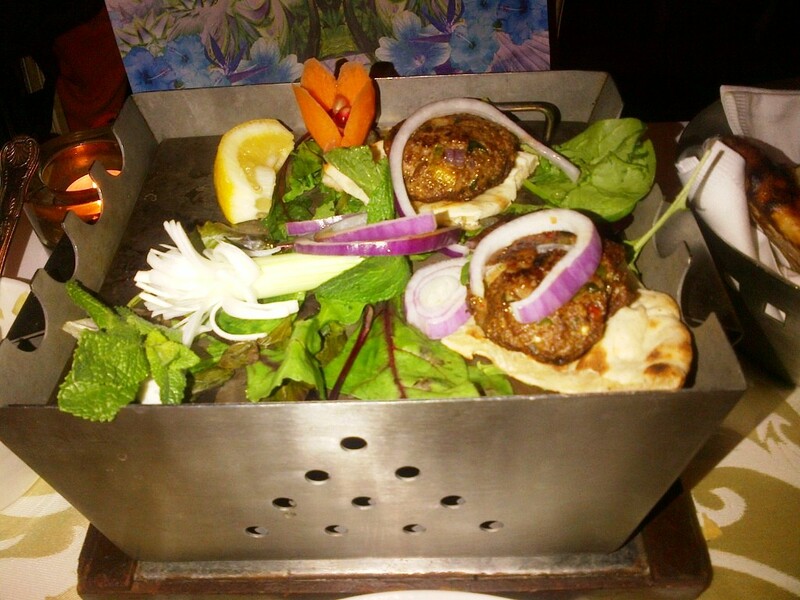 Again the flavours were amazing but tasted very different to the Seekh kebab. The pan grilled kebabs were not at all disappointing and as you can see from the picture below, I couldn’t wait to try them so the picture only shows half of the portion! Overall I have to say, I was pleasantly surprised. Although I quite proudly talk about how I have no real use to go out for Indian food given that my mother is such a good cook herself, we always go out for the grilled meats and whilst Lahore is both cheaper and closer, Gaylord could quite easily become the place to visit on special occasions for good quality, authentic Indian food, without any of the chefy artistic touches!! Plus they do brew quite yummy Indian masala tea, always a selling point for me! !